The chapter provides empirical evidence on the Danish case. 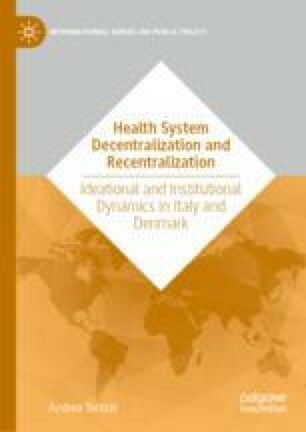 It describes the establishment of the highly decentralized Danish National Health Service (NHS) that took place between the 1960s and 1970s, presenting the main ideas and arguments which supported the creation of such an institutional arrangement. The chapter then describes the changes that occurred during the 1990s and 2000s and provides an explanation of why and how recentralization within the politico-legislative and fiscal dimensions of decentralization took place, showing how some arguments in favor of decentralization were debated and challenged. Finally, the chapter discusses the operation of the mechanism of ideational and institutional bricolage which has brought about the endogenous and evolutionary changes of the NHS. Christiansen, Terkel, Hans Okkels Birk, and Andreas Rudkjøbing. 2015. “The Role of the Regions under Discussion”. Health Policy Updates, The Health System and Policy Monitor. Available at http://www.hspm.org/mainpage.aspx.